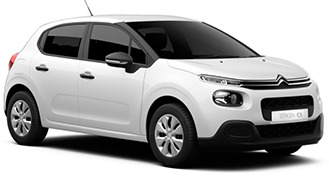 The brand new model of the French manufacturer Citroen C3 is an excellent vehicle with compact size, equipped with many extras and fuel efficient engine PureTech 68 BVM Live. The compact sizes of Citroen C3 make it very maneuverable and pleasant for driving as well as parking in the heavy city conditions. This efficient car has unique design which brings personalisation and differs from the masses in the most popular car segment- supermini class. Сitroen C3 is perfect for urban and non-urban driving. One of the main advantages of Citroen C3 is the convenience. The cabin of Citroen C3 is with comfortable size and can normally transport up to 5 passengers. The trunk is with good capacity and could fit 1 big and 1 smaller suitcase.